As someone who works with start-ups and SMBs, finding low-cost, high-impact tools is an absolute necessity. Fortunately, the usability world has been blessed by dozens of new tools over the last couple of years. While many excellent blog posts have been written about these tools, I decided that it was time to take a deeper dive. Most importantly, I wanted to test these tools on User Effect and try to provide real data and screenshots. In the end, I decided that a blog post just wasn't going to cut it this time around, and so my second e-book was born. I'm happy to announce that I'm making that e-book available for free as of today. 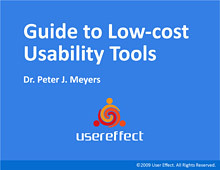 It's a guide to 20 online usability tools, all of which have free or low-cost versions. The e-book is absolutely free, and you can download it using the button below. It's in PDF format, and is about 1.5MB. If you plan on printing the document and don't want to waste all of your blue ink, here's a printer-friendly version. I hope you enjoy the e-book and all of these resources. As always, comments, criticisms, and crazed fans are welcome. * Full disclosure: User Effect is a partner of UserTesting.com and an affiliate of Userfly.